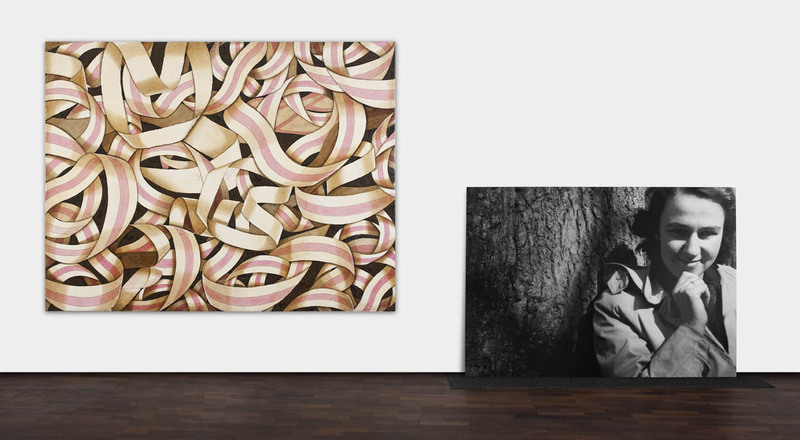 EXPO: Galleri Ramfjord, Oslo. Norway. 16th august-7th September 2014. EXPO: GALLERI RAMFJORD, OSLO. NORWAY. A storm is brewing. On the windswept bridge, Auntie EU bumps into The Scream and shouts: “It’s my right to be a stranger”. And soon after History flies onwards, probably with its back to the future, so there is certainly a high risk of collision. Acrylic on canvas, 115.7 cm x 177 cm. 27/03/2014. 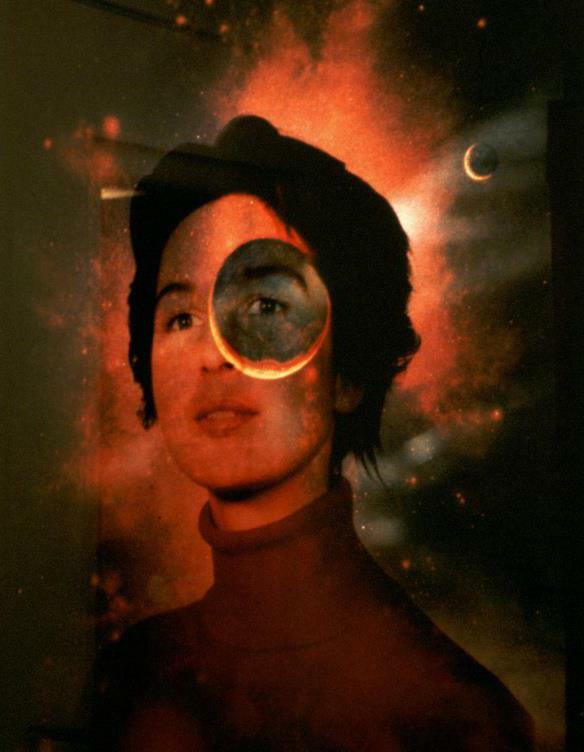 In the periodical ’UdTryk’ Lise Jeppesen, the curator and chief executive at Randers Kunstmuseum, writes an interesting article on my solo exhibition ‘Navnet og dets Plads’ (‘The Name and Its Place’), which I exhibited in Randers Kunstmuseum. 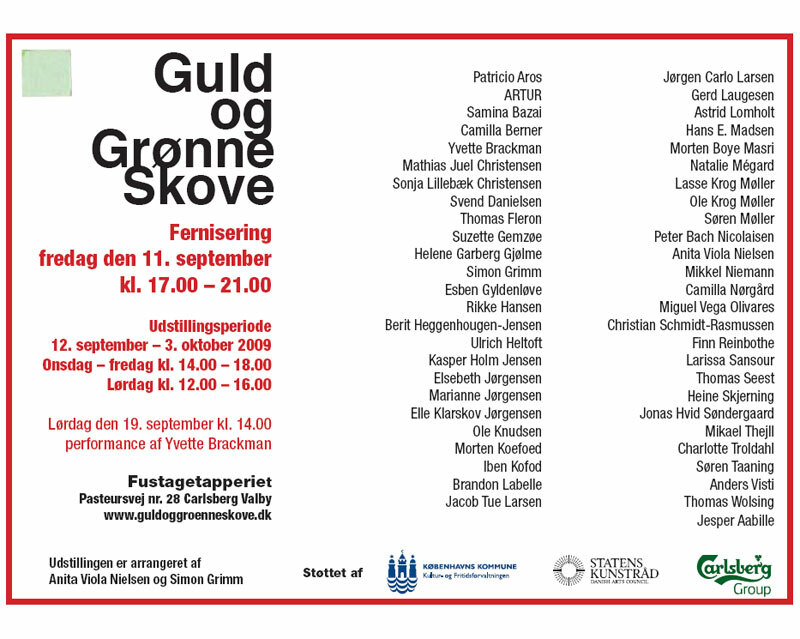 The article gives an insight into my work with images, even though in my present painting, ‘Tante EU møder Skrik’ (2014), which I am pleased to be able to exhibit in Galleri Ramfjord, I focus on a different signifier (a different meaning) and aspect, than Lise Jeppesen. In my work, I generally build on my experiences as well as my research and working production, which herein includes my education at The Royal Danish Academy of Fine Arts in Copenhagen, and the EHESS university in Paris. 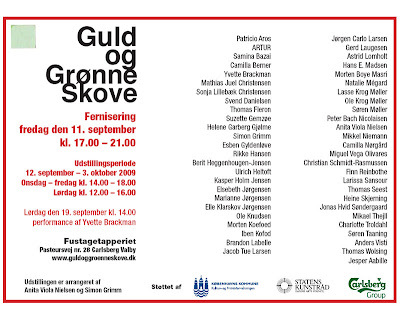 I build on my experiences from exhibitions I have participated in, amongst others ‘Schlager-Projektet’ shown in the European Parliament in Brussels (2012), as well as the exhibition ‘De Vilde’ in Arken Museum for Moderne Kunst (2010-2011), and the solo exhibition ‘Navnet og dets Plads’, Randers Kunstmuseum (2009). See my CV for further information. 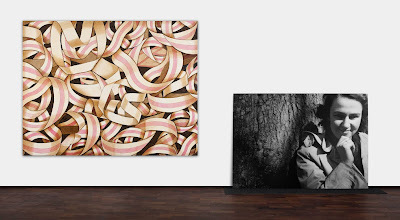 It is interesting to meet people in connection with exhibitions and listen when they speak directly about my work, with a starting point in their unique and social experiences, and formulate new images in their own varied ways. 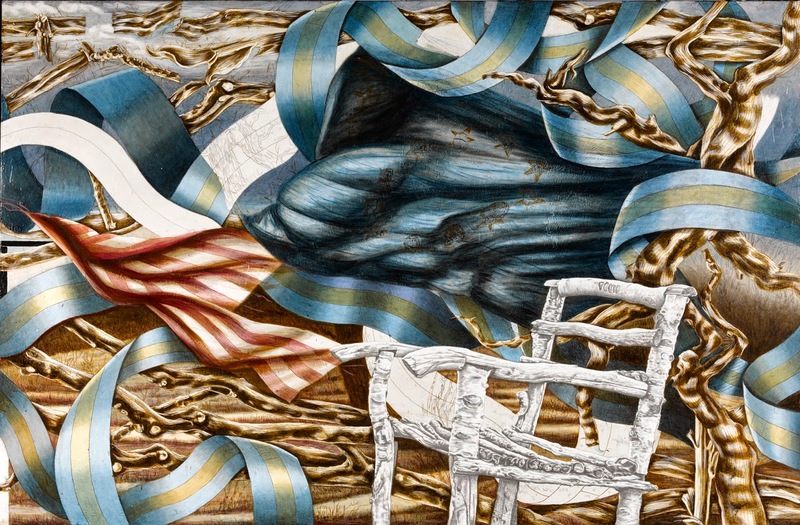 Empirically, and to certain extent conceptually, I explore the subject’s utterance and its place in that we call democracy; in historical, etymological, and social terms, as well as culturally and politically. I inscribe my investigations in colours and materials which then become paintings – a bio-geo topic. The subject, which I focus on and study in order to better understand it, refers to the unconscious. The unconscious is an inner utterance, which is structured like a kind of alphabet. I point out that the image is not silent material but that it refers to speech, as I have inscribed the subject’s discourse in the work via the materials. And because I believe that this discourse (the subject’s utterance) is what we hear, and what we speak about when we see the image. Furthermore, I question whether there is place for it (subject) in social, cultural and political society, and what do we do with it? But who is the subject? Why be interested in its utterance? Or, put another way: why be interested in mankind’s comings and goings? One of the answers could be, to gain more knowledge. Because I take responsibility for it, in order to give it a place to be and a place from which to speak. Here a point, or selection, could be that the unconscious controls the conscious ‘I’, but without one being aware of it – as I understand it. We know much of the conscious and less of the other. We always say ‘I’, while the subject (which refers to the unconscious) is mostly perceived as ‘a stranger’, or ‘something strange’, which we often neglect. Or it is kept out – or in. And it is actually notable, and a little paradoxical, as long as the unconscious controls the ‘I’ and its choices. 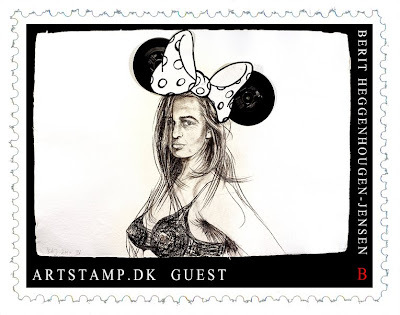 The New Carlsberg Foundation and the Kirsten & Palle Dige Foundation are to donate one of my upcoming artworks to ARoS Aarhus Kunstmuseum in Danmark. New release. 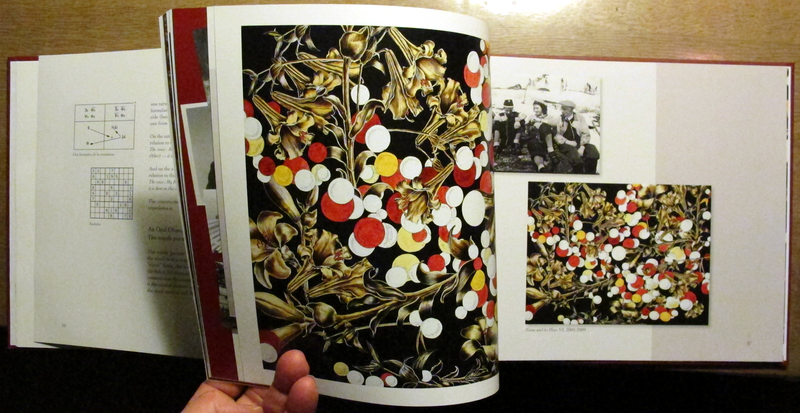 Book: 'Name and sin Place' (2012). A text and picture book. About the name’s deixis (display, demonstration, reference, the meaning point of reference). Contextual information referred to by deixis are those of person, place, and time. Text in English. 48 pages. Moderna Museet in Stockholm is the owner of one of my 'oral objects' (painting). Agreement signed the June 11th 2011. 2011. 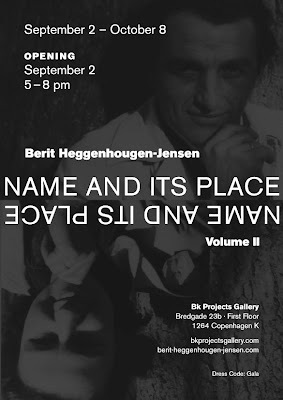 Expo: Name and its Place. Volume ll. September 2. 2011 - October 8. 2011. 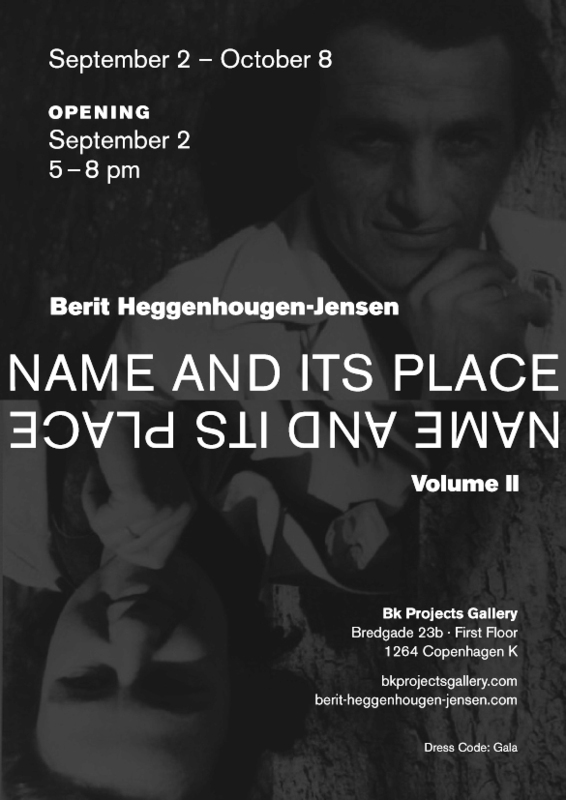 BK Projects Gallery, Bredgade 23b. First Floor. 2009. 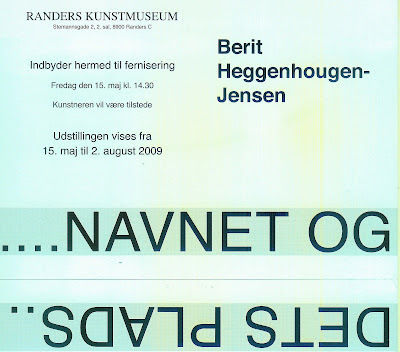 Soloudstilling Navnet og dets Plads, bind l, (2009), Randers Kunstmuseum.